Finishing a sign, banner, wrap or specialty item can be a multifaceted, potentially profitable process that should not be ignored. Knowing different opportunities and options will improve your bottom line, and some of these processes have even been automated for you. This will help you become more efficient while also becoming more profitable. Part 1 of this finishing series will begin by exploring banner finishing and laminating. We'll start with the tried and true sign banner - typically printed on a 13- to 18-ounce banner material. Some of the finishing options include grommets, hemmed or taped edges, and possibly wind slits (though it's best to avoid cutting wind slits into a banner, as it jeopardizes the structural integrity). The options are quite numerous, but this article will focus on only a few. It will also show the possibilities for automation to help streamline the process. Grommets come in many sizes, colors (including clear) and styles, from brass self-piercing to adhesive edge tabs. There are a number of choices in the manual hand-operated variety that all rely on the same basic idea, which is to load a two-part self-piercing grommet into the machine one at a time, then use pressure to "weld" the two parts of the grommet together. From this manual process, the grommet machines become more robust with automatic feeding of the grommets all the way up to a pneumatic device to cut through multiple layers and tough fabrics. It's important to remember that metal grommets, like wind slits, break the structural integrity of the banner material. Typically a banner will fail at the point of the grommet, which is why it's a good idea to fold over the edge of the banner and create a finished edge (much like the process of sewing). Then when the grommet is placed into the banner, it is through more than one layer of banner material, giving it even more strength. There are many different ways to prepare a banner for grommets, either by folding over the edge and securing with double-sided banner tape; sewing to create a hemmed edge; or actually creating a weld with either heat or RF (Radio Frequency) equipment. An example of this is Miller Weldmaster Corporations' line of equipment. Aaron McMahan, Automation Equipment Sales at Miller Weldmaster, notes that the AES 1900 can weld and grommet two outside edges of a banner at the same time in 15 seconds. With a second pass, the machine can weld all four sides in only 40 seconds. The AES 1900 utilizes an automated transport system for continuous production and is adjustable to various lengths and widths for nearly any size banner. An alternative to grommets is the adhesive edge tab. One advantage is that you aren't cutting into the material so it isn't compromised. However, the drawback is that the plastic material that makes up the edge tabs will deteriorate over time and can fail. A key point to remember is that many banner manufacturers will only rate their banner vinyl for one year of outdoor exposure due to ultraviolet radiation, which causes the banner material to crack and disintegrate - and edge tabs should be able to stand up for this same period of time. To create larger banners than can be printed in multiple sections such as a billboard, wall covering or building wrap, it's essential to be able to "weld" the two (or more) pieces together. Some of the options discussed previously (sewing, RF or heat welding) are used to create these large prints. In the early days of aqueous printers, it wasn't a question of 'should we' or 'do we need to laminate,' because there really was no choice. The inks were not durable enough to resist the slightest scratch or abrasion, and the UV protection offered by the laminate gave a little more life span to the print. 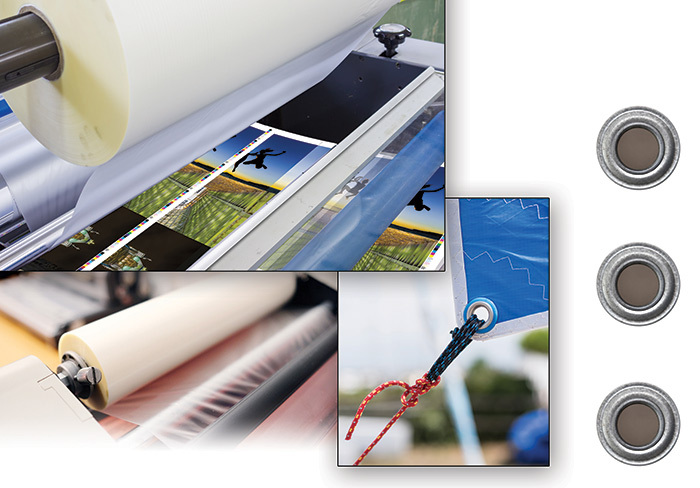 Today, with solvent, eco-solvent, latex and UV inks being abrasion-resistant and UV-durable all on their own, laminating is more of an afterthought - an afterthought that could be an additional revenue stream. Number 1: Cleanliness is very important when laminating. Dust or dirt inclusions that become trapped in a laminated image not only detract from the finished product, but cannot be removed without damaging the image. Inclusions can be picked up from a dirty laminator, worktable or floor as well as a dusty environment, and can then be transferred to the image being laminated. Always wipe off both your laminator and worktable before starting the lamination process. Never set the roll of print media or laminate on the floor, and do not let it unwind to the floor because dust/dirt particles can be picked up in the adhesive or folds of the material. You should also clean the image to be laminated with a lint-free cloth or dust removal roller before it goes into the nip of the laminator. Using compressed air to blow off the machine or image is rarely a good idea because it can cause dust to become airborne. Number 2: Using the right amount of tension can make or break quality output. If there is not enough back tension on the supply shaft that holds the laminate, the material will sag and not conform to the roller, which will in turn cause wrinkling. It may also cause your roll of laminate to move on the shaft. Too much tension will cause your material to curl and possibly delaminate because of the stress during application (much like a spring that's coiled and ready to pop). Too much tension will also cause binding and undue wear on the laminator. Using the right amount of tension will allow your graphics to run effortlessly through the machine and provide finished prints that lay flat. Number 3: Use a leaderboard to web the laminator. Ideally, a square leaderboard with a straight edge will allow your material to run straight through the rollers without wrinkles and will reduce material waste and frustration. First, pull the material to be webbed over the roller, several inches past the nip. Push the leaderboard to the nip, ensuring it is even across the roller. Then, step on the foot pedal to start the web and pass the leaderboard between the rollers. Follow the leaderboard with the image to be laminated. Another area to explore is the wide variety of laminates that are available. From gloss, matte, hot, cold, anti-graffiti, floor coverings and more, the list includes hundreds of options. Suffice it to say that there are hundreds of options when it comes to laminates. Always check with your manufacturer when considering specialty laminates, such as floor graphics or vehicle wraps, as there are warranties offered that may be voided if you do not abide by specific terms. It's crucial to always match the vinyl with the laminates. This means that if you are using a calendared vinyl, then you need to pair it with a calendared laminate, and the same goes for a cast vinyl. Not pairing matching vinyl and laminate may result in de-lamination. Liquid lamination is another option to consider when adding protection to a print. Liquid laminate typically costs less than a rolled laminate and produces less waste. There are three main types of liquid laminates: water-based acrylic urethane, solvent-based polyurethane and oil-/solvent-based UV-curable. Coatings can be applied with a HVLP (high volume, low pressure) spray gun, roller or brush (depending on application and the coating). Typically, a gallon of liquid laminate will cover approximately 640 square feet of media. This is affected by relative humidity, evaporation and the porousness of the substrate or media. It is important to test the liquid laminate so that you know how it may affect the underlying media. To do this, check with the manufacturer to make sure you are using the appropriate liquid laminate for the ink type. I have observed instances where the liquid laminate caused the vinyl to buckle and pull away from the surface, so testing in advance would ensure this does not happen to you. 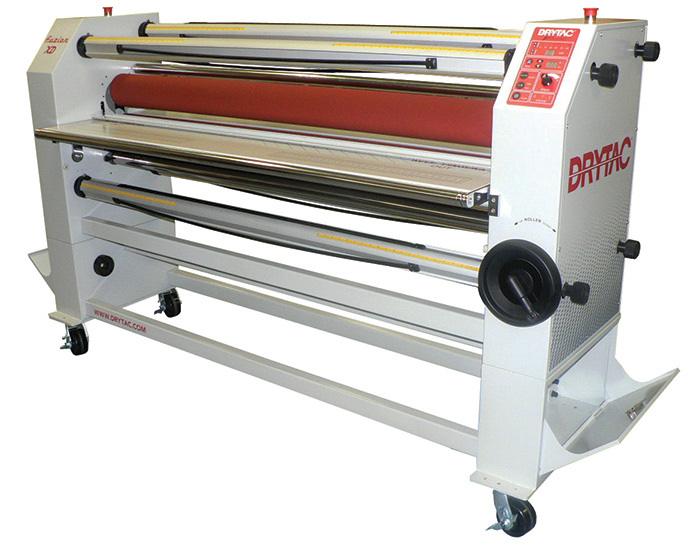 When it comes to laminators, the main choice is hot or cold - with the top-heat model fitting between the two extremes. It used to be a given that a hot laminator was the way to go since the laminates for a hot laminator were less expensive than those for a cold laminator. The difference in price is not as substantial these days, and there are a number of reasons that a cold or a top-heat laminator may be a better bet (just a little bit of heat can prevent "silvering," which will go away in 24 hours). For one, once you have a hot laminator up to temp, it can take one to two hours to cool down enough to change over to a cold laminate process. Heat can be a problem for some vinyls, causing them to change shape or deform, which will make them want to de-laminate once they cool back down. Some shops will do all their hot laminating in the morning, turn the heat off while they go to lunch, and do any cold laminating in the afternoon. Not the most efficient way to go, but it does work. Another consideration for a laminator is whether to have a crowned roller or not. Many of the low-priced cold models will have a roller that is not crowned, which means the only pressure you get is the weight of the roller. For most processes, this is more than sufficient; however, if you need more pressure, you will typically be using a crowned roller. This applies pressure in the middle first - so when using a crowned roller laminator, you always want to have your laminate centered on the machine. Some shops will use a piece of vinyl with printed horizontal lines, which they run through the machine as they dial in the pressure. If the pressure is creating a problem, the horizontal lines will begin to "smile" or curve, signaling that they have too much pressure. Let's not forget the other use for a laminator, which is to serve as an extra pair of hands when mounting signs on foam board or some other rigid substrate. So often someone struggles to mount a print to a piece of coroplast or foam board only to have a wrinkle or bubble ruin the final product. Using a laminator to assist in applying the graphic is easy and makes for a perfect final piece. Start by peeling back about an inch of the release liner from the print and create a "hinge" by folding it all the way back. Next, take the exposed adhesive and carefully apply it to the substrate at the top edge. Once you have it lined up and adhered to the substrate, insert this leading edge into the nip of the laminator. Grab the folded back release liner hinge and pull it away as the substrate moves through the laminator. You will end up with the release liner in your hand and a smooth, wrinkle- and bubble-free mounted print at the other side of the laminator. We've looked at some of the processes with banner finishing and laminating, and that makes this a wrap. In Part 2, I'll look at some of the finishing challenges for rigid substrates including laser etching, routing and the automation possibilities that exist in this area of finishing. Ray Weiss, Digital Imaging Specialist for SGIA, recently joined the Association in 2014. He provides solutions and technical information on digital printing and digital imaging issues as well as digital equipment, materials, and vendor referrals. Ray started his career in offset and digital imaging after eight years in the USAF in the security field. His career began in the graphics industry with a typesetting and prepress business in Washington, DC, which grew into an offset print operation in Maryland. He then moved into sales, training, support, and service in the wide format industry for over 10 years. Ray has extensive experience with many of the major RIP software and printer manufacturers, and worked closely with the Smithsonian Institution to implement a color managed workflow in their Exhibits department. This article appeared in the SGIA Journal, November / December 2015 Issue and is reprinted with permission. Copyright 2015 Specialty Graphic Imaging Association (www.sgia.org). All Rights Reserved.